Chile's education minister has been impeached by parliament and barred from public office for five years for alleged corruption. Yasna Provoste had already been suspended by the lower house of parliament, and she lost an upper house motion of confidence by one vote. She is accused of failing to account for the disappearance of millions of dollars of school subsidies. 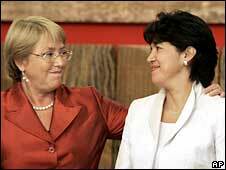 The move marks a new low for President Michelle Bachelet government. Ms Provoste, 38, is the first Chilean minister to be impeached for 36 years, and it comes as Ms Bachelet's approval ratings continue to slump. As a young, female minister with indigenous roots, Ms Provoste represented exactly the kind of face the president wanted to promote when her centre-left government took office two years ago, the BBC's Gideon Long in Santiago says. But a probe by official auditors found that subsidies had been paid to school which overstated the number of pupils they had enrolled. President Bachelet's government defended Ms Provoste, putting any financial discrepancies down to accounting mistakes, and saying pressure for her removal was politically motivated. But the government was beaten in the Senate by the votes of a handful of rebels who had recently defected, giving the opposition a parliamentary majority. The worry for Mrs Bachelet is that the rebels will do the same in future votes, making her a lame duck president for her remaining two years in power, our correspondent says.